Fig. 2: (a) Rise and fall of ocean noise observed at IMS Juan Fernandez station in 2008 as a result of C19a iceberg break up. The 11-14 Hz and 30-36 Hz frequency ranges were chosen to minimize the influence of blue and fin whale calls (S?irovic? et al., 2007). (b) Spectrogram of calving event on day 169, 2008. The same icequake signals from C19a also were observed by the OSU/NOAA's portable hydrophone array in the eastern equatorial Pacific. 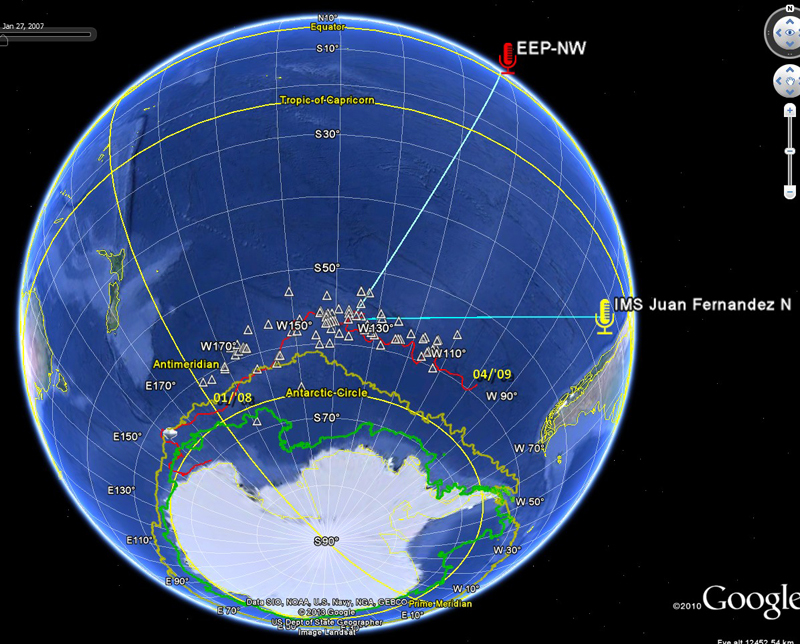 EEP-NW was approximately 7,600 km - 8,400 km from the iceberg in 2008, which was about twice the distance of Juan Fernandez Island. Sound travels in the water at ~1,500 m/s; therefore it took ~1.5 hours for the iceberg sound to reach the EEP hydrophone. Fig 3(a) is the 13-year record at EEP-NW (with a 3-year gap) and shows that the noise level in 2008 is approximately 40% (~3 dB) higher than a normal year in the 11-14 Hz range. Fig 3(c) shows the 30-36 Hz noise level averaged over 10 years, which shows March-high and September-low seasonality. This noise level increase partially disrupted the annual cycle of seasonal variability that is observed in ambient noise level within the equatorial Pacific. The 34-year averaged sea ice extent off Antarctica (Fig 3(b) exhibits the exact opposite of the noise level seasonality. Fig. 3: (a) Noise levels at NOAA's equatorial hydrophone. 2008 anomaly coincides with C19a break up. (b) Monthly sea ice extent off Antarctica from 1978 to 2012. (c) 10-year average of monthly 30-36 Hz noise level at EEP. Elevated noise level anomalies at these two locations in 2008 can be explained by the presence of a large iceberg C19a in the open ocean of the south Pacific. Annual mean tonnage of icebergs in the sea ice-free southern ocean north of 67 degrees S is about 400 Gt. This represents ~35% of the mean annual mass calving from Antarctica (Tournadre et al., 2012). Typically less than 50 tabular icebergs, with size larger than 5 km, are tracked by satellite at any one time (Long et al., 2006). Most icebergs are smaller than 5 km but large in total volume. Therefore, they may play an important role not only in climate, fresh water flux and ocean circulation, but also in modulating the soundscape of the Southern Ocean. The release of icebergs trapped in sea ice starts at the beginning of the austral summer (Kunz, et al., 2007) when sea ice extent is at a minimum (~17% of maximum on average) (Cavalieri et al., 2003). Once in warm open water icebergs start disintegrating by thermal, wind, and current stress and collisions with other icebergs and the seafloor, and it starts getting noisy. Disintegration slows down as the sea ice advances and restricts the movement of the icebergs in the austral winter, and the Southern Ocean becomes a quieter place. The study suggests that a single unusually large iceberg from Antarctica altered the low-frequency sound environment across much of the southern hemisphere. Moreover, the austral-summer-high and winter-low noise seasonality observed at mid-to-low southern latitudes may in part be controlled by the seasonal sea ice extent off Antarctica, the presence of drifting icebergs in open water and their breakdown during the austral summer. Cavalieri, D. J. and Parkinson C. L. (2003). "30-year satellite record reveals contrasting Arctic and Antarctic decadal sea ice variability." Geophys. Res. Letters, Vol. 30, No. 18, 1970. Kunz, L. B. and Long, D. G. (2007). "Melt Detection in Antarctic Ice Shelves Using Scatterometers and Microwave Radiometers." IEEE Trans. Geoscience and Remote Sensing, Vol. 44, No. 9. 2461. Long, D. G., Ballantyne, J., & Bertoia, C. (2002). "Is the number of icebergs around Antarctica really increasing? ", EOS, Trans. Amer. Geophy. Union, Vol. 83, No. 42. S?irovic, A., Hildebrand, J. A. & Wiggins, S. M. (2007). "Blue and fin whale call source levels and propagation range in the Southern Ocean." The Journal of the Acoustical Society of America 122, 1208. Talandier, J., Hyvernaud, O., Reymond, D. & Okal, E. A. (2006). "Hydroacoustic signals generated by parked and drifting icebergs in the Southern Indian and Pacific Oceans." Geophysical Journal International 165, 817-834. Tournadre, J., Girard-Ardhuin, F. & Legresy, B. (2012). "Antarctic icebergs distributions, 2002-2010." Journal of Geophysical Research 117, C0504.